Of course, if it’s done properly. According to the report there is not enough detail about schools or transport. Isn’t that a resurrection of what was planned a decade or so ago before the great bust! 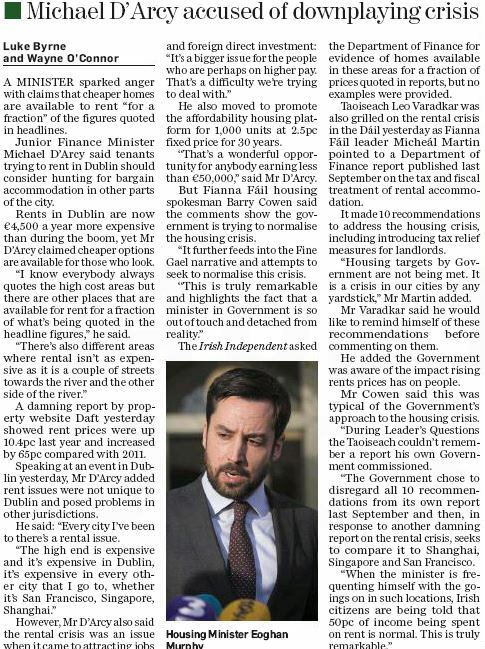 Official data shows that 5% FTB have claimed a tax refund of up to €20,000 to offset the cost of buying an expensive property, prompting calls for the scheme to be targeted at more affordable homes. Details of the 4,824 claims paid to date and raise fresh questions about whether the incentive is properly targeted at those who cannot afford to buy, or is simply helping inflate prices. Shock as tax incentive scheme benefits people who pay a lot of tax. I issued a termination notice to my tenants a number of weeks ago. 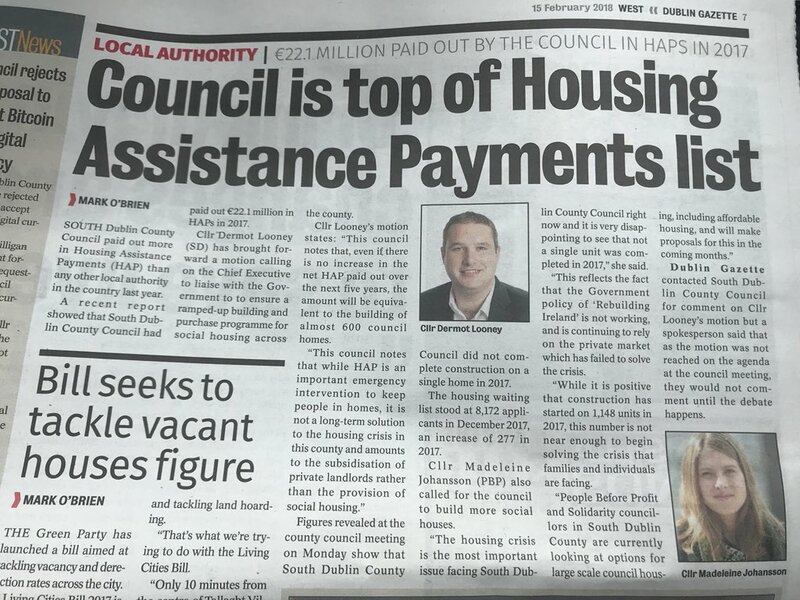 They are on RAS , so are county council tenants. I received an email today from the council stating that if they cannot find them suitable accommodation in the same area they will be overholding !! They told me to check my notice of termination that it’s in order as I’ll need it when it goes to the RTB … I was shocked at the manner of the county council put this email together … it proves that landlords aren’t protected whatsoever by them. They give you 20% below market rent but tell you you are secure with them. They effectively told me today that I’m to lodge a complaint with the RTB and the notice isn’t even up for another two months. I saw from twitter one of the micro parties did a post on housing solutions. They are probably a little ambitious in what they think is possible in Ireland. That’s a typical boards thread with more heat than light. What the local authority is saying is that **if **the tenant cannot find suitable accommodation locally **and ** she chooses not to move on **then **there will be an overholding situation. This is not something the local authority can either prevent or encourage. They are sensibly advising the landlord to have their ducks in a row in case it goes legal. Just read all of that. SDCC could build almost 600 houses in the next 5 years rather than give money which goes to landlords’ pockets. *A presumed homeless man staying in a hotel at the expense of the State was found with €12,000 in cash and a further €140,000 in a bank account when he was targeted in a planned operation by the Criminal Assets Bureau. The 39-year-old was targeted as part of an investigation into a criminal gang involved in burglary, theft of plant machinery, and defrauding elderly people on bogus jobs. Five searches were conducted in Co Wicklow: Two residences in Newtownmountkennedy and two residences in Bray, as well as a professional office in Bray. It is understood the man was temporarily homeless and required emergency accommodation and was provided with accommodation in the hotel by State authorities. He was involved in **a gang, involving members of the Travelling community, *here suspected of burglary, theft of plant machinery and targeting the elderly. why should property be open to foreign investment?! Across Asia, foreigners are not allowed to buy land or property, or indeed start a business, without a local partner who is generally required to own 51%+ of the venture. I assume that this is a hangover from the colonial era when entire countries were owned by wealthy, sometimes absentee, foreigners to the detriment of the local population. To have experienced that in the past and to allow it occur again would, presumably, be a sign of stupidity…right??? It’ll help if you believe that lack of profitability is holding back construction in high-demand areas. If there is some other reason (e.g. lag in demand response caused by capacity/funding issues) then it’ll just fill the pockets of the builders. To take a ridiculous analogy, imagine there’s a progrom on hairdressers which you dodged because you were on holiday in Ayia Napa. You return from hols and there’s a queue round the block to your salon, so you raise prices. If VAT is cut, are you going to cut more hair? No, because you are capacity constrained. It takes time to train up new staff so in the meantime you’ll just get richer.